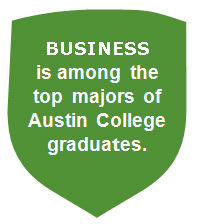 Austin College’s Culture has long honored the value of engagement in the community. 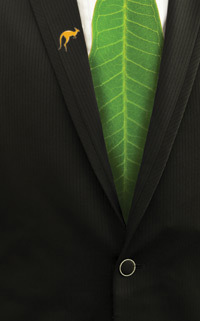 Is taking care of the environment simply a good deed, or is it a reasonable expectation for manufacturers in the 21st century? Is it enough that they make a high quality product, on time and on budget? Or can they, should they, save the planet while they’re at it? Good questions for Dr. David Griffith, Austin College Morris Chair in Entrepreneurial Studies, and his upper-level marketing class, in which economic theory and mathematics come face-to-face with the real world. 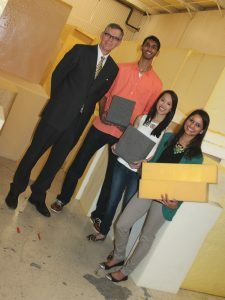 Students take on a business client each semester and develop a solution to a specific challenge. In fall 2013, the students were introduced to Starr Aircraft, a manufacturer of airline interior products, and its particular environmental challenges. Starr’s problem is common. It’s difficult, if not impossible, to use 100 percent of raw material when making goods. Byproduct happens. And, every few weeks another tractor trailer heaped with scrap rolls out to the landfill. Starr Aircraft, headquartered in Sherman, works out of 52,000 square feet of manufacturing space with more than 100 highly skilled employees. Starr produces a diverse line of products for the interior aircraft industry, including textile fabrication and embroidery, and foam cutting for airplane seats. They also make chart holders and fuel flow computers. Rodriguez suggested three criteria: meet a clean environment goal, create primary products, and pair with a non-profit. Students didn’t have to accomplish all three, but consider them in their planning. Rodriguez said the students asked a lot of insightful questions, but one that impressed him was, Why us? Why doesn’t Starr take care of this? Or, in other words, how do we, as college students, add value? Recognizing the need to reduce waste and transportation costs is one thing, but having the time to figure out how to do it is another. Starr Aircraft clientele are some of the largest companies in the industry, including American Airlines, Southwest, United Airlines, and Boeing. The company is tasked with serving its clients with high-quality products that meet extensive safety regulations. 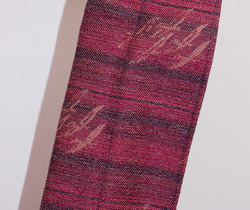 Not just airworthiness, but aesthetics and comfort are part of the package. There’s no margin for error and little time for anything unrelated to the ever-changing business at hand. At Austin College, it’s the students’ job to think out of the box. So, they faced truckloads of foam, beautiful high-quality leather strips and scraps, and industrial-grade upholstery fabric. Odd sizes. Odd shapes. What to do? Estefani Castillo ’15, a business administration major with a minor in Spanish, worked with her team focusing on cost efficiency. For instance, Starr Aircraft receives its raw materials on pallets every week. Pallets make piles. Piles get moved to the landfill, and that’s not free. 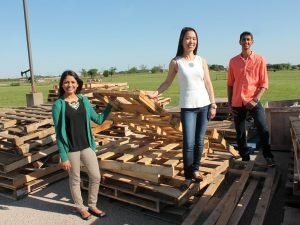 So, by locating IFCO-Dallas, a wooden pallet recycler that will pick up and pay for the pallets, the students were able to initiate negotiations between the two companies. IFCO is the largest pallet recycler in North America that repairs and re-circulates pallets. Those beyond repair are ground into landscape mulch, animal bedding, or wood stove pellets. IFCO-Dallas is only 60 miles south of Sherman, so the arrangement is cost effective for all involved. 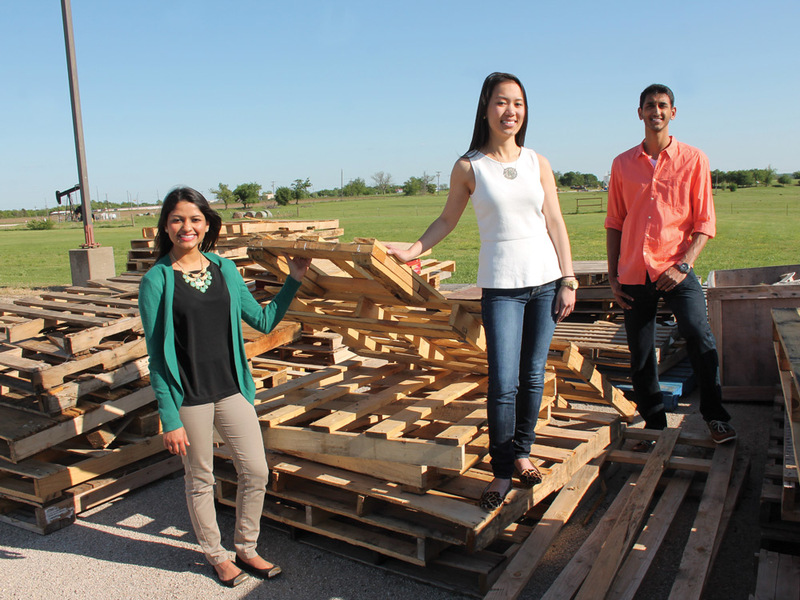 Pallets are out of the landfill, and money is in the bank. The same student group also addressed the leftover foam material. 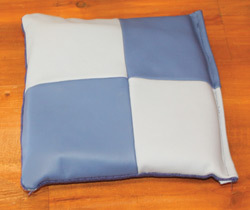 In the course of making comfortable, high-quality airplane cushions, foam is cut away to meet customers’ specifications. Starr uses most all kinds of foams, including polyethylene and polyurethane. The Austin College team researched the contents of these to identify which were suitable for recycling. They also calculated how often enough product accumulates to merit a load to the recycler. Another student team that included Naina Singh ’14, a business administration major, identified the non-profit organization Backpacks With a Purpose (BWAP). BWAP is an Oklahoma City company that provides high-quality backpacks to children in need. Launched in 2002 to serve the Urban Mission in Oklahoma City, the non-profit expanded in 2012 to include a retail line. The retail backpacks are designed for adults, and with each purchase, BWAP gives two child-sized backpacks to a local or international non-profit of the buyer’s choice. Most sales are online but a few retail stores across the United States are adding BWAP backpacks. “BWAP’s mission to help families and Starr’s mission to recycle its waste material go hand-in-hand, as both companies have the potential to benefit from one another,” Singh said. “We reached out to BWAP explaining to them that Starr was willing to donate scrap materials to their cause if they wanted to implement the scrap material in making their backpacks,” Singh said. The leather makes a sturdy base; the foam is a good cushion for shoulder straps and laptop pockets; and the durable fabric could make the body of the backpack. BWAP personnel replied, saying that in 2015 the organization aims to start a “green” line of backpacks in which the use of Starr materials would be ideal. And then there’s the student who took up the materials in his own hands and created something new. After considering several environmentally friendly concepts, William Camp ’15 and his team recommended using the materials to create cots and pillows for donation to local shelters to help people who are homeless or in crisis. As the professor, Griffith says his role in the project is to drift through the groups, redirect when he sees duplication of ideas, and encourage the students to dig for great ideas. Rodriguez, who worked closely with Griffith, would say more. “He came out and took a tour and learned about Starr Aircraft as a company,” Rodriguez said. “He is pragmatic and engaged in the class—knowing what he wants to accomplish with the time.” Knowing the requirements of the class, the needs of the client, and the timeframe to do the work, Griffith finds a good-fit project each semester. Over the years, Griffith has charged his marketing class with different kinds of issues. Students worked with two different non-profit thrift stores to conduct site studies, which required them to evaluate traffic patterns, calculate rental costs, consider neighboring businesses, and identify clientele. Other cases include Presco, a manufacturer of films and outdoor marking products, and the public library in Pottsboro, Texas.